Las Vegas bets on Elon Musk's Boring Company for tunnel projectLas Vegas' Convention and Visitors Authority has recommended selecting Elon Musk's The Boring Company to build and operate a "people mover" at Las Vegas' convention center. The project would be relatively small, encompassing the convention center itself rather than transporting people across town or to the airport - but The Boring Company could expand the tunnel system after it's constructed. Tesla Model S parks inside Elon Musk's Boring Company tunnelThe tech entrepreneur, who wants to build a tunnel network for cars starting in Los Angeles, finds a sweet underground parking spot for his Tesla Model S.
The Boring Company Just Got Permission to Extend Their Test TunnelIn Brief The city council of Hawthorne, California, has given the Boring Company permission to extend the test tunnel built under their headquarters by 1.6 miles. However, this permission is just one step of the process, and Elon Musk's company will need to secure additional permits before drilling can commence. 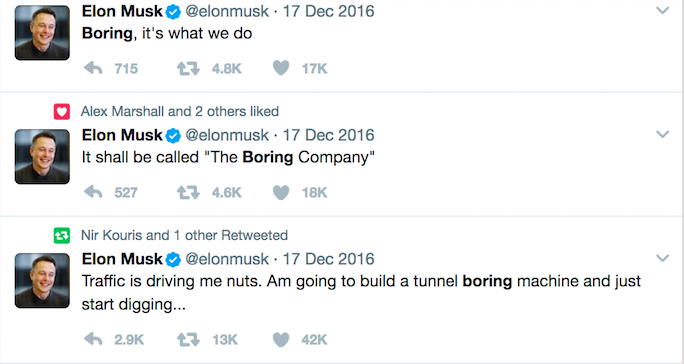 How Elon Musk launched The Boring Company to revolutionize tunnel diggingBillionaire innovator Elon Musk is known for his California rocket and electric car businesses, but he looked to the Midwest to show he is serious about building an ultra-high-speed underground rail system from New York to Washington, D.C.
Would you recommend The Boring Company to a friend? Eugene Berlin has never used this product. Elon Musk stuck in traffic, comes up with totally futuristic idea to end traffic. Elon Musk tweets, said futuristic idea to end traffic. Calls it the Boring company. "Boring, it's what we do." 5 months later, reveals futuristic new company at TED. If 👏 this 👏 was 👏 a 👏 movie 👏 it 👏 would 👏 be 👏 considered 👏 "too out there" 👏 to 👏 be 👏 reality. 👏 Very proud of my good friend Elon. @nivo0o0 We need this here in Lahore, PK! @nivo0o0 Tunnels never REALLY had great life span in human history. Why go underground.. if you can fly? @lyondhur @nivo0o0 there was an article about this a few weeks ago. Musk argued that flying cars aren't as good an idea as everyone thinks they are. Hard to control all of those flight paths and crashes could be extremely dangerous. His example was imagine a hub cap coming off and flying through the air. @lyondhur @nivo0o0 Totally agree with you, why go underground, why not go for overhead roads? @andrewaskins @nivo0o0 I'm not necessarily implying flying cars only, but over-the-ground trains and cars systems (flying, as in speed). However, we're quite close to a technological jump that's unprecedented. I see NO BIG AN OBSTACLE to manage an entire network of airways for flying vehicles with Artificial Intelligence, as it reaches a favourable point to do so. I heard it in a conversation with fellow designers and teacher friends that Musk's reluctant argument around flying cars revolves around the fact that he himself doesn't have a stake in it. Yet. Meaning, we'd be too behind in that race, as he is far too involved with tunnels, solar and neural networks. I won't be surprised if his argument completely changes in 10 years. This guy is like James Cameron's sequel to Steve Jobs. What happens to the gaping hole left in the road after the car descends? @ben_ingignieri @wuss So, NYC day to day? @skaragiannis @thejeremycarson you would kill yourself to send a copy of yourself to your destination? Seems mad. @bitfalls @thejeremycarson who says that? Old movies ? I believe we don't even know what's coming with biocomputing and quantum physics and other tech. Ai seems so predictable compared to them! @thejeremycarson 1% solution for a 1% problem. The real problem is "how do we get the most people from point A to point B as comfortably and with as little friction as possible". What this is solving is "how do I get me and my beloved car that is mostly driving just me around 90% of the time, from point A to point B as comfortably and with as little friction as possible". @thejeremycarson Why do you think it would only remove a few dozen cars? You can have many many layers of tunnels. In the video he talks about how you can dig much farther down than the tallest skyscraper. The world's least boring Christmas gift.